Eyvonna Rains has written a lovely little book for children that will be requested at bedtime over and over by children from 4 – 8 years. Even children a little younger will like the lilt of the story as they go through each page. I wish I had young ‘grand’s to read it to at night. Some of my favorite memories at that age are of my mother and grandmother sitting next to my bed at night telling stories or reading to me. The author relates all of the beneficial aspects of sleep such as helping a child to grow and retain things that a child has learned. Then, she tells of dreams that a child will have. Read this book to your child, or download the audio that comes free with the book and let them listen to it as they pour over the pages with the bright and colorful illustrations by Kristen Polson. 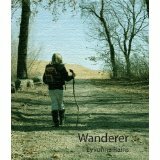 Eyvonna Rains has written a charming little volume of poetry with an oversize message that reflects a spiritual journey through life that she entitled Wanderer. She shares spiritual thoughts that touch everyone and relates romance and motherhood with that spiritual journey. As you read the poems, there will be some that specifically touch you that you will want to go back to and re-read. She shares humor within several of the poems that made me remember how I felt in those same situations. I especially liked “You” as I felt the same way when my husband was late or made a joke at my expense and “Naptime”, remembering my own times wanting to get something done as my young son slept. The book is available on amazon.com as a Kindle edition or from the author through her website www.eyvonnarains.com. Eyvonna Rains lives in Oklahoma with her husband, Eric and her two boys, Parker and Cooper.